March 13, 2013, 7:00 p.m. The new guild president, Jessica Rider, began the meeting with announcements. Our first sew-in of the year is March 23 at the Blue Ash Library from 10 a.m. to 3 p.m. Lunch will be provided, so we need to have sign-ups. Bring your machine and we’ll have cutting stations and ironing stations set up. Hospitality: Michelle Kirby. Thank you to Lynn Wood, who has done this for years. Education: Ellen McKee. If you would like to share something with the group, please let Ellen know. Swaps: Amy Thonneroux and Teresa Seitz. We are still looking for a chairperson for Fundraising to raise money for the guild. 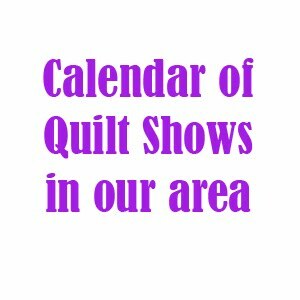 IQF (International Quilt Festival) is April 11–13 at the Duke Energy Convention Center in downtown Cincinnati. We have an exhibit in the show, with 21 quilts from our guild on A Modern Take on the Dresden Plate. Preview night is Wednesday, April 10, which is our regular guild meeting night. We will have our regular meeting at the Centennial Barn. 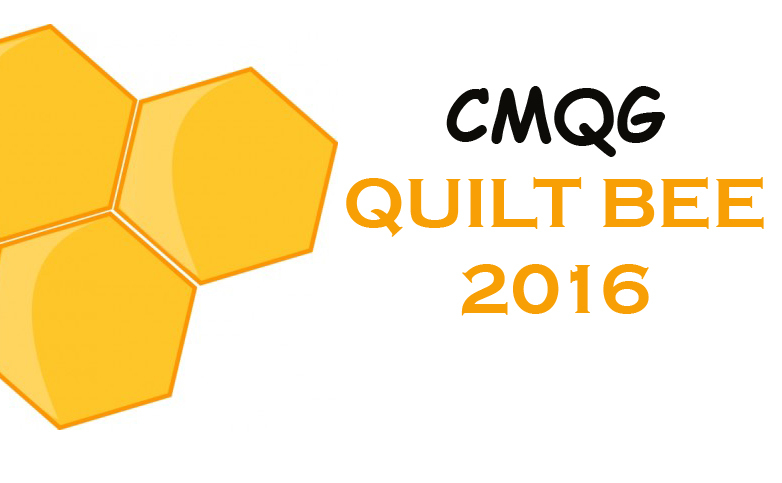 Holly will bring the quilts to the convention center on Monday, April 8. 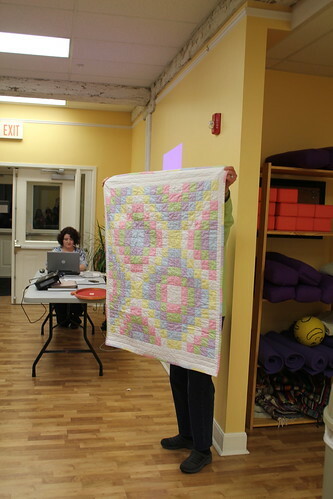 You are responsible to pick up your own quilt on Saturday, April 13, at 6:30 p.m. at the volunteer worker check-in desk. The IQF needs people to work for the festival also. Our guild is hosting a Modern Meet-Up on Thursday, April 11, from 7 p.m. to 9 p.m. at Nicholson’s Pub on Walnut & 7th, right across from the Aronoff. We have some great sponsors who are contributing great prizes for this. 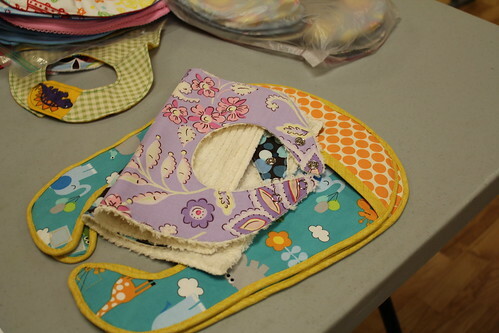 Craft Hope Bib Drive: Lynn has two adopted children from China, and another mom is adopting a child and going to China in April. She will take our handmade bibs there to the needy children in China. 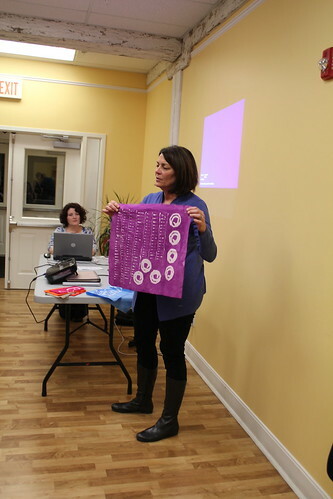 You can still make bibs and send them to Lynn by March 27 and they will still be in time for this project. We have 54 bibs so far, so we have already surpassed our goal, but feel free to make more if you’d like. Our next charity project is in progress. We have a new Member Statement, which is written on our member sign-up sheets. This is the purpose of our guild: to encourage one another, to learn from one another. 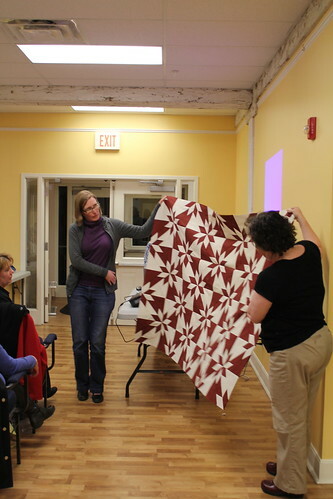 Everyone is welcome but our focus is on modern quilting. 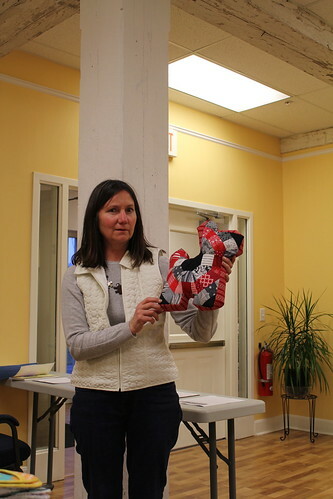 Janine made a pillow from a Denyse Schmidt patternScottie Dog out of the block that Carrie swapped with her last month. 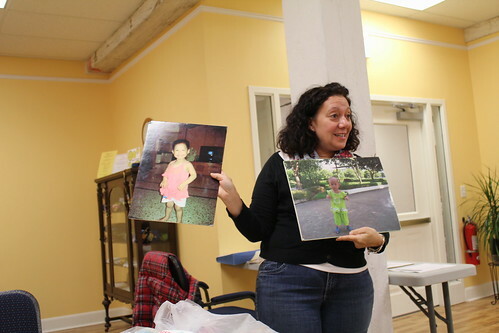 Carrie made an art portfolio from the block that Janine made and swapped with her last month. Amy and Teresa announced next month’s swap: an upcycled project in honor of Earth Day, which is next month. This is a challenge and not a swap, which we will be doing more of this year. You will keep whatever you make. 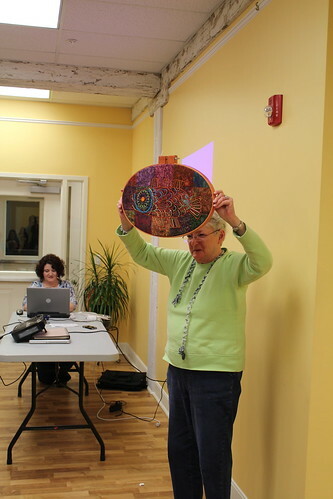 Teresa brought the pincushions from the MQG pincushion swap and distributed them to people who made pincushions. 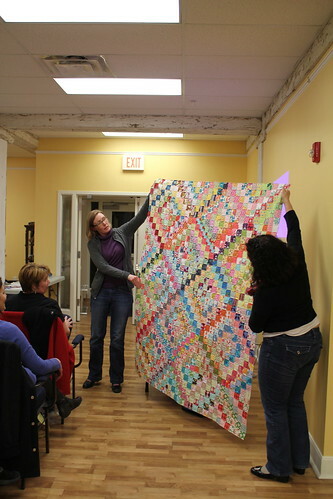 Cass Plott is the featured artist with 12 quilts at the Rising Sun Quilt Fest (risingsunquiltfest.com). 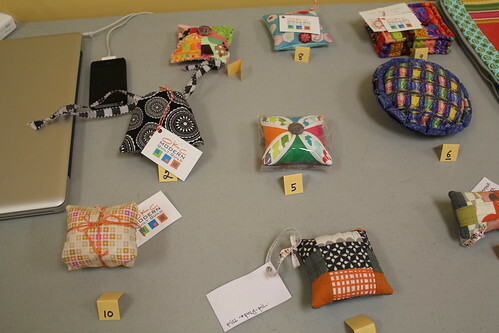 After the break, the new board members technology and quilting. Nancy showed Facebook and Instagram, Christine showed Google Reader and blogging, Heather showed Pinterest and Twitter, and Jessica showed Flickr. 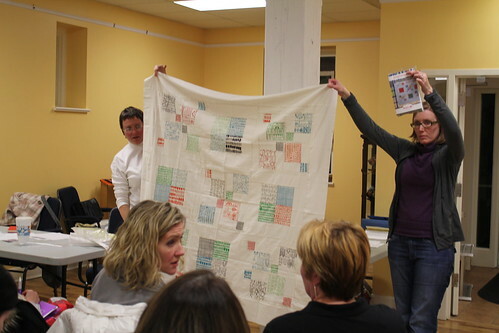 QuiltCon participants shared on QuiltCon: Ellen and Teresa showed projects that they made in Valori Wells’s workshop. 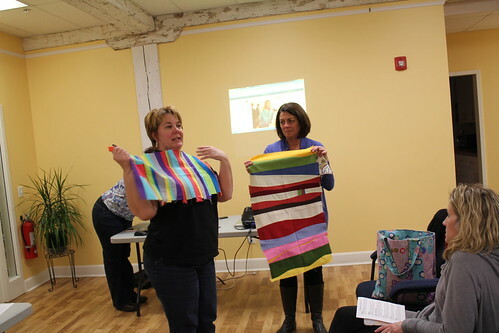 She taught to always use one “ugly” fabric in projects. 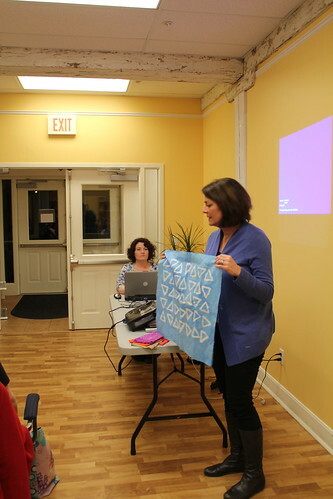 Ellen also took a class from Elizabeth Hartman on how to use freezer paper as a template. 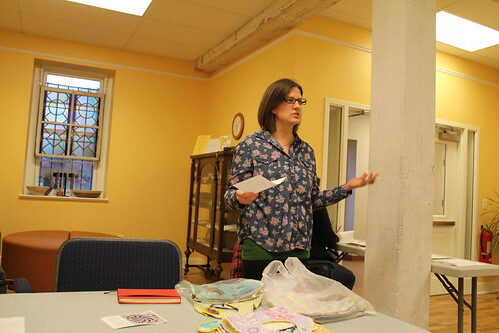 Teresa shared that the lectures (including Heather’s) are available for free on Craftsy.com. 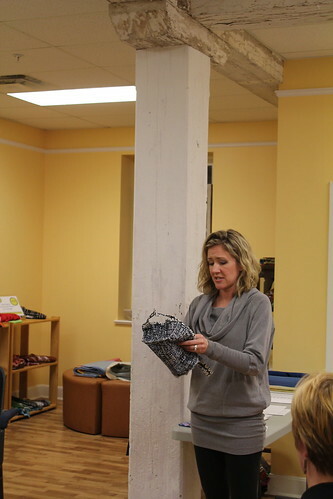 Michelle showed a Sew Together bag she made from a Sew Demented pattern onCraftsy. She made a Kitchen Sink skirt in Jay McCarroll’s class at QuiltCon. 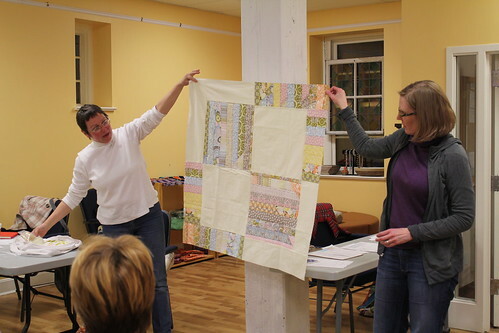 Heather took Anna Maria Horner’s class on composing a quilt by using orphan blocks instead of using a pattern. 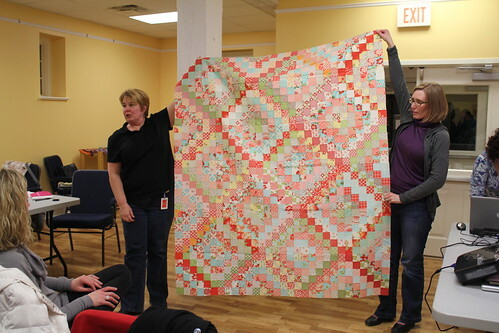 She also took Denyse Schmidt’s Improv class and showed the completed quilt top. 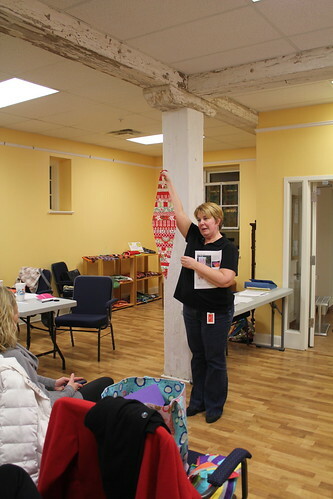 They drew fabrics out of a bag blindly and worked on a block for 30 minutes then put them on the design wall. Then they incorporated the fabric they brought (1/2 yard) by cutting it as little as possible, sewing curves, and continuing the blind construction process. 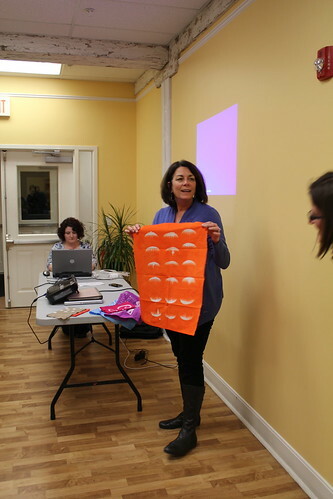 Teresa shared some wax resist dyeing projects she made from instructor Malka Dubrowsky at QuiltCon. For Show and Tell, Cass shared three quilt tops she pieced from last month’s guild challenge, where Andie challenged us to complete something we’ve started. 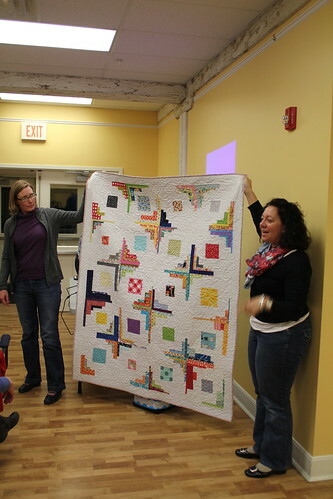 And she showed a quilt that will be on display at the Rising Sun Quilt Fest. 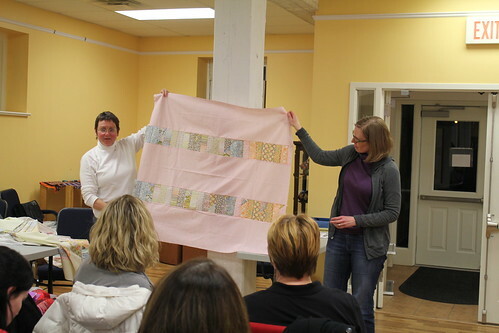 Ellen showed her Scrappy Trip quilt that she made from mostly Bonnie and Camille fabric. 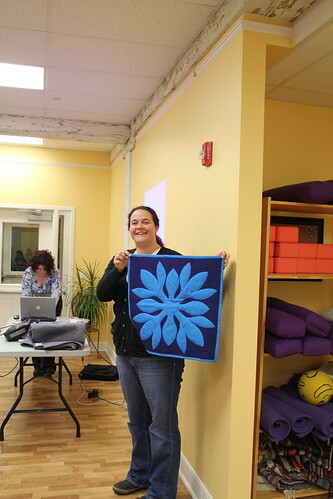 Christy showed a machine appliqué project and an Ohio Supernova quilt, one of Heather’s patterns. Lynn showed her do.good.stitches quilt for Project Linus that Jill quilted and a Scrappy Trip quilt that Jill also quilted. 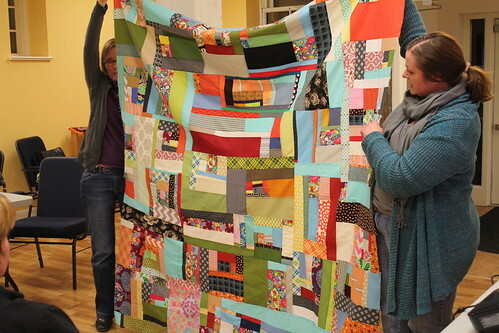 Carrie showed a baby quilt for a prenatal charity quilt. 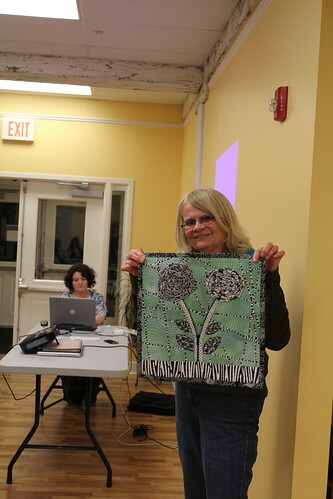 She also showed a beautiful quilt art project. 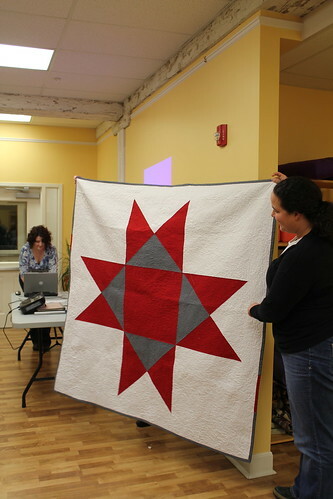 A guest to the meeting showed a Rapid Fire Hunter’s Star quilt template and quilt top that she made. 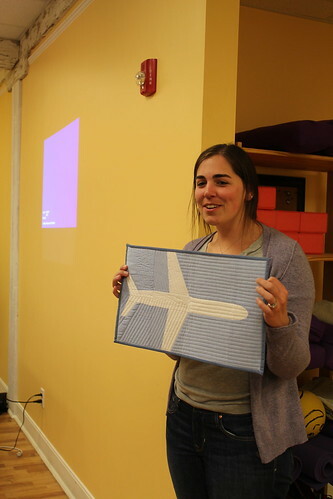 Amanda showed her finished airplane quilt from an ArtGallery tutorial. 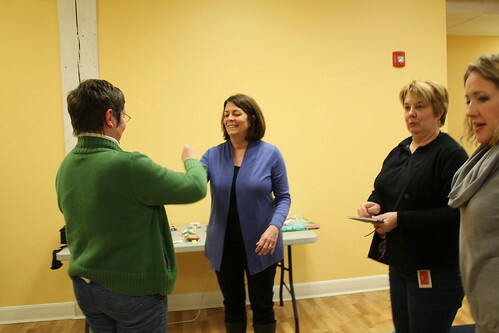 New member Kara Sanders invited guild members to a sew-in in November at Hueston Woods. Registration and more details are on her blog, Me and Elna. I think so too. I love seeing all the pictures!